Judas criticizes Mary for anointing Jesus’ feet, saying the money could have been given to the poor. One would expect Jesus to agree. Why should such a sum be wasted when it could have in fact been used to feed many. But that isn’t what happened. Instead Jesus turns to Judas and rebukes him, not because what he had said made no sense. But precisely because it made too much sense—at least in Judas’ calculating mind. Poor Judas, up to this point, he still didn’t get it. He was still operating on the world’s calculations of investment and return. He had become too worldly for his own good, material concerns were still his priority. 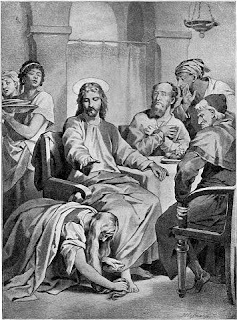 Mary anointed Jesus’ feet in what Jesus himself saw as a symbolic gesture foreshadowing the anointing he will receive at his death. But more than that it was an expression of Mary’s love for Jesus, a love that went far beyond the utilitarian calculus out of which Judas operated. The gospel reading tells us why Judas found Mary’s action unacceptable. It wasn’t really because he cared for the poor, but because he stole money from the group’s contributions. Intentions and motives, as always, made all the difference. Mary’s action may have been extravagant, but her motive was pure. Judas’ indignation may have been understandable, even salutary, but his motive was impure. For God what is in the heart is what counts the most.